eBay Offers 1st Dividend In 24 Years:Clueless or Genius? Home Stocks & Dividend Research eBay Offers 1st Dividend In 24 Years Clueless or Genius? eBay Offers 1st Dividend In 24 Years Clueless or Genius? Is eBay Using A Last Ditch Attempt To Rescue Itself From Irrelevance, Or Is This A Genius Master Stroke? Can It Still Compete Against Amazon? Should You Buy? The online retail and auction platform eBay Inc. (NASDAQ: EBAY) plans to offer a quarterly dividend after 24 years as a publicly-traded company. Does eBay Pay a Dividend? eBay plans to pay its first quarterly dividend of 14¢ on March 20, 2019, NASDAQ reports. 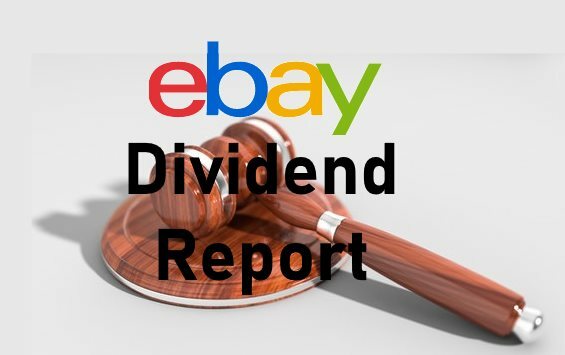 Meanwhile, Dividend.com estimated eBay will have a dividend yield of 1.63%; an annualized payout of 56¢, and a payout ratio of 30.4% a share on February 1, 2019. Investors will take notice of eBay’s dividend because of its low share price. In fact, eBay shares were trading at $34.33 on February 1, 2019. Thus, eBay is paying a high dividend for its share price. The eBay dividend appears sustainable because of the company’s revenue growth. For example, eBay reports revenues of $2.877 billion for 4th Quarter 2018, up from $2.707 billion in 4th Quarter 2017. Notably, eBay’s revenues beat the company’s forecasts of $2.55 billion to $2.60 billion and analysts’ target of $2.66 billion, Reuters reports. In addition, eBay’s revenues grew from $2.649 billion in 3rd Quarter 2018 to $2.877 billion in 4th Quarter 2018, Statista calculates. Furthermore, eBay reports revenue growth for 10 straight quarters. In particular, eBay’s revenues grew at a rate of 6.04% in 3rd Quarter 2018 and 9.14% in 2nd Quarter 2018, Stockrow concludes. Thus, seems capable of generating enough revenue to pay a dividend without cutting its operations. eBay’s growing sales figures indicate the company could achieve several years of revenue growth. In fact, the number of active users on eBay’s platform rose from 170 million in 4th Quarter 2017 to 179 million in 4th Quarter 2018, Statista estimates. Unfortunately, the platform growth is not translating into additional business. The gross merchandise volume (GMV) at eBay grew by just 1% in 4th Quarter 2018, Reuters reports. To clarify, GMV is the total amount of goods eBay moves through its platform. Thus, eBay is generating more revenue and attracting more customers but not moving more merchandise. In addition, eBay’s GMV is in its home market the United States fell by 1% in 2018. On the other hand, eBay’s sales grew by 6.3% between 4th Quarter 2017 and 4th Quarter 2018. Hence, there is still a strong market for eBay’s products that is growing. Moreover, the eBay e-commerce platform is extensive and expanding. Notably, eBay claims to offer 1.1 billion items for sale. Impressively, eBay claims users have downloaded its apps 349 million times worldwide. In fact, eBay is still the second most popular online retail destination in the United States. Markedly, eBay received 817.6 million visits a month in 2018, meanwhile, America’s top online retail destination; Amazon (NASDAQ: AMZN), received 1.87 billion visits a month in 2018. Importantly, eBay still receives over twice as many monthly visits as Walmart (NYSE: WMT). The Balance estimates Walmart.com received 339 million visits a month in 2018. Interestingly, eBay competes directly with Amazon and Walmart because 87% of its GMV is fixed price. In addition, 80% of the merchandise currently sold on eBay is new. Thus, eBay is a mass-market retailer rather than an auction website. eBay is a value investment because it receives a tremendous amount of web traffic. Plus the number of visits proves eBay is still a strong brand with a good reputation with customers. Additionally, eBay is strengthening its appeal to customers with new promotions like the Price Match Guarantee. To explain, eBay promises to match prices on over 50,000 deals in the United States. The Price Match Guarantee is necessary to compete with deep discounters like Walmart and Amazon. Beyond, the Price Match Guarantee eBay claims 50,000 new items are available daily in eBay Deals. There are currently 900 sellers participating in the eBay Deals promotion. eBay is trying to match Amazon’s customer service with guaranteed delivery and free shipping on all eBay Deals items. In addition, most of the eBay Deals merchandise comes with a money-back guarantee. Presently, eBay is making from its e-commerce platform. For instance, eBay reports a net income of $670 million for 4th Quarter 2018. That number was up from $554 million in 3rd Quarter 2018 and $618 million in 4th Quarter 2018, Statista calculates. Thus the income from eBay’s business is growing along with its revenues. Notably, eBay records annual net income of $2.53 billion for 2018. That number was up from a -$1.017 billion loss in 2017. Tellingly, eBay is generating a lot of cash from its business. For instance, eBay reports an operating cash flow of $2.658 billion for 2018. However, that number is down from $3.146 billion in 2017. Given these circumstances, it appears eBay can generate enough cash to pay the proposed 14¢ dividend. The company’s e-commerce platform is growing and generating more income. However, eBay is having problems maintaining the high cash flow. Therefore, eBay’s dividend is sustainable, but it could limit future dividend growth. In fact, eBay could run low on cash at some point, limiting future dividends. Why is eBay paying a dividend after 24 years? There is a simple reason eBay is paying a dividend after 24 years of issuing stock. Management is issuing a dividend because eBay’s stock price is low for an online platform. In fact, eBay shares traded at $34.33 on February 1, 2019. In contrast, Amazon shares traded at $1,642.52 on the same day. On a relative scale, eBay is operating at a PE Ratio of 10, with an operating cash flow of $2.7 billion and a market capitalization of $33 billion. Whereas Amazon has a PE Ratio of 72 with an operating cash flow of $30.7 billion and a market capitalization of $795 billion. eBay compared to Amazon is a small fish, but it is a profitable small fish with earnings as a percent of sales of 23.5%, compared to Amazon’s earnings as a percent of sales of only 4.33%. Therefore, management is trying to grow the stock price by paying a dividend. To elaborate, management hopes to attract a different investor with the dividend and gain some wider appreciation for the actual value investment proposition of the company. A lower PE Ratio and a higher profit margin than Amazon means it is more attractive for the large market of value investors. In particular, eBay is trying to attract income and value investors by paying a dividend. Plus, eBay wants to appeal to retirement investors and managers of retirement instruments like mutual funds. This is a smart strategy for eBay because the demand for retirement income is growing dramatically. Notably, 10,000 Americans turn 65 (the standard retirement age in the USA) every day, Forbes contributor Adam Bergman estimates. What do you think to eBay offering a new dividend? Will it help? Leave a comment below.